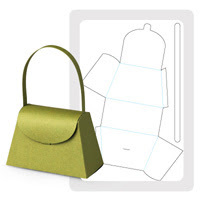 Craftin' Caro: VIDEO: "Petite Purse" die project! VIDEO: "Petite Purse" die project! Ever need a fast, fun, and simple party favor? Stampin' Up! 's Petite Purse die will help you to create those favors in record time--and style! Watch as Emily Montoya highlights this new and exciting die, available NOW as part of our Summer Smooches collection being promoted this month. Be sure to check back on the blog later this month for more cute ideas on what to make using the Petite Purse die!